New Jersey’s Turkish and Islam Cultural Center, according to its website, offers courses on Armenian Genocide denial to children as young as six. The list of activities offered at 203 Fountain Avenue, Burlington Twp, New Jersey 08016, are English as a second language for adults, Friday prayers, weekend school for children and discussion groups. According to the website, that class is offered for two age groups: 6-15 and 16-25. I read in the comments that some of you thought it was inappropriate for me not to post about the anniversary of Armenian genocide (which took place [during and] just after World War) and that I was being selfish for spending my day shopping instead. For those of you who don’t already know, I am half Armenian. I do not speak Armenian, but my late father instilled in us a lot of Armenian culture. After my day of running errands, I spent the evening with my late father’s side of the family. I went to an Armenian dinner with my family, like we often do. Of course, cameras weren’t there for that — and some things I like to keep private. But all of the chatter really got me thinking… Do I know as much about my Armenian history as I would like to? The honest answer is… no. That night at dinner my sisters, brother and I decided it is mandatory that we go to Armenia. None of us have ever been, neither had my dad and neither have my grandparents! My great grandparents were from Armenia and escaped the genocide. No one has been back since. All I know about my country is what I read and pictures I see on the Internet. My parents couldn’t tell us stories because no one has been! So, this generation is going to change that! We don’t know when we are going to go, but we four kids have decided it is something we should do! I heard it is beautiful and we are all really excited about it! A fouding father of Israel died yesterday, and his close friend told Haaretz that the “commander of exodus” was inspired by Armenian resistance during the Genocide. The man who commanded the clandestine operations that brought in four ships carrying some 24,000 illegal immigrants between 1945 and 1948, Yossi Harel, died yesterday in Tel Aviv at the age of 90. The writer Yoram Kaniuk, a friend of Harel, told Haaretz that when the ships he commanded sailed past the coast of Turkey, Harel would think of the Armenian village in Franz Werfel’s novel “40 Days of Musa Dagh,” which described the Armenian genocide. “He loved the Armenian people and felt close to them,” Kaniuk said, adding that he wanted to mention Harel’s sensitivity to the Armenians as a sign of the great humanitarianism and compassion that were central to his Harel’s character. Writing in his weekly USA ARMENIAN LIFE MAGAZINE column (received in an e-mail), managing editor Appo Jabarian shares reactions to a broadcast video, also posted at YouTube.com, in which he criticized opposition leader Levon Ter-Petrosyan and defended Armenia’s government’s actions in the March 1, 2008 post-election clashes. The mere conflict of interest and action by the Ecological Academy raises a number of questions. Is “Ecological Academy NGO” confounding its vision of “Armenia’s future in sustainable and socio-economic development of the society, in parallel with environmental improvement and harmony” with its anti-Armenia political activities? Isn’t Ecological Academy a non-profit organization that is exempted from income taxes, and as such is governed by the strict laws of Armenia? Does one of the Armenian laws not explicitly bar NGO’s from any overt or covert political activity? Speaking of NGO’s in Armenia, there is no question that several NGO’s are honest and genuine humanitarian enterprises. However, according to various reliable sources, there are a number of Armenian NGO’s that are set up by foreign funds for the explicit purpose of covertly meddling in Armenia’s internal political affairs. Is Ecological Academy one of these covert “NGO” operations? Shall any of us be surprised to discover that certain NGO’s are fronts for espionage and other treacherous activities, undermining the national security of a target nation — in this case Armenia? There is no question that Armenia’s national security authorities are highly aware of the potential dangers presented by certain so-called NGO’s. However, they may need to further step up their scrutiny of these foreign-funded NGO’s. A beautiful monument to the Armenian Genocide in downtown Budapest, Hungary, was desecrated by suspected Turkish nationalists on April 24, 2008, the day of the commemoration of the 93rd anniversary of the Genocide. 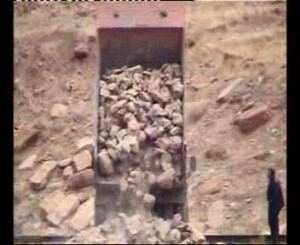 A YouTube.com video shows devastating and disgusting imagery of the vandalism while PanArmenian.net refrains from reporting the worst of the desecration. I have also received an e-mail from Jean Eckian with four vandalism photographs, taken by Hungarian journalist Ingrid Hutterer. Image: Harutyun and Krikor Tashjian, native boys from Malatia, western Armenia, recovered from an Arab tribe. Through Hrag Vartanian’s blog, where he posts a photograph from the Armenian Genocide and tells his family history, I came across to a set of newly-uploaded photographs from the Genocide. The photographs are part of the Nubarian collection owned by the Armenian General Benevolent Union (AGBU). Some of them show rescued women and children completing our recent post on similar, newly-published photos. The conventional Turkish attitude was reflected in a large event in Turkey. 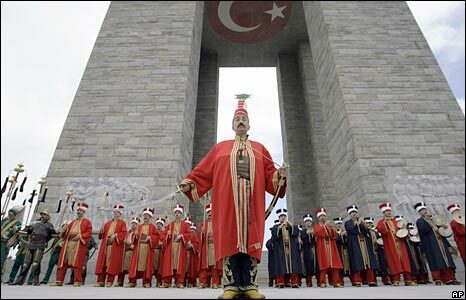 According to the BBC, “Turkish soldiers, members of the traditional Ottoman army band of Mehter, perform[ed] …during the 93rd anniversary of the World War I campaign of Gallipoli.” The battle of Gallipoli, according to Wikipedia, “is perceived as a defining moment in the history of the Turkish people—a final surge in the defense of the motherland as the centuries-old Ottoman Empire was crumbling.” The Turkish understanding of Gallipoli has been extended to nationalist attitude toward the Genocide. The few who proudly admit they committed the crime, argue it was for the sake of saving Turkey. For Armenians, the Genocide was not an act to save the Ottoman Empire but to expand the Turkish leadership’s imperialist desire of establishing a Pan-Turkish empire from the Balkans to China. The Armenian nation, according to many Armenians, was the obstacle to expansion. They held the keys to the frontier. In Armenia, hundreds of thousands of people visited the Genocide memorial in the capital city Yerevan. Some had brought pigeons for peace (as seen in the picture above), while another brought a Turkish flag to step on. Interestingly, Turkey’s nationalist Sabah newspaper was quick to report the latter. But another Turkish newspaper, Taraf, devoted its front page to the Armenian Genocide yet was careful not to use the word genocide. (I received the .pdf version in an e-mail from Turkey and its English translation from a Turkish friend in California.) It published the names of the Armenian intelligentsia members who were arrested and eventually killed on April 24, 1915. Taraf’s article was nothing close to recognition or acknowledgment, but given the high degree of ultra-nationalism in Turkey it was indeed a progress. In fact, a dangerous one too. A Kurdish newspaper, for example, was closed down after publishing photographs from a possible Armenian mass grave in 2006 (later cleaned up by the Turkish army and presented by the Turkish historical society as a Roman cave). But like the Armenians who have survived the Genocide, the closed Kurdish newspaper continues to publish… under another name. Its website is now http://www.aktuelbakis.com/ and it just published another story on the Armenian Genocide. 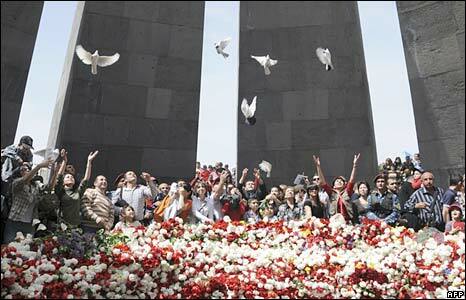 Outside Armenia and Turkey, the Genocide was also commemorated. In Southern California – the largest Armenian hub outside the Republic of Armenian – thousands joined hands in marching for genocide recognition. Also in the U.S., the White House released a statement by President George W. Bush commemorating the Armenian Genocide in another failure to refer to the Genocide as such. In the meantime, House Speaker Nancy Pelosi talked of the importance of recognizing the Genocide in a video posted at YouTube.com. In Lebanon, another Armenian diaspora, people came together to pray for the dead ones. Conventional and unconventional media remembered the Genocide as a blow to Hitler’s reference that the Armenian extermination is forgotten. Agence France Press wrote about the commemoration in Yerevan posting a map of the areas where Armenians lived before 1915. The National Geographic Magazine posted a map of Wilsonian Armenia, the territory given to the Armenian nation under the Treaty of Sevres (1920) with a short history on the Genocide. The World War 4 Report, a website for indigenous rights, wrote about the Armenian Genocide and its argued connection to Artsakh – Nagorno Karabakh. In one place, the message of the Armenian Genocide anniversary was summarized in a few words: no nation is above global justice. Azad-Hye (free Armenian), an online Armenian portal in the Middle East, has launched an online radio – http://www.azad-hye.com/radio/. Mother Jones has an interesting story on how Ku Klux Klan outfits are made by one woman seven days a week. Read the story at http://www.motherjones.com/photos/aryan-outfitters/.